Willkommen! Here's my latest "Persistence of Vision" column, this time on a favourite opening sequence - from Bob Fosse's Cabaret. When a film is based on a popular Broadway musical – full of loud and flamboyant production numbers – you expect it to begin with panache, or at least with a little light music. Instead, Bob Fosse’s Cabaret opens with white titles on a black background, in the bland style of a made-for-TV docudrama. As the seconds crawl by you might wonder if there’s a problem with the sound, but then you hear gentle murmurs and the image on the screen slowly, very slowly, resolves itself into a distorting mirror: we see reflections of people seated at tables, a waiter passing with a tray in his hand, a woman wearing a bright red dress. Finally there’s a roll of drumbeats, the words “Berlin 1931” appear on the screen, and a man’s face – rouged, heavily made up – fills the mirror. Meet the Master of Ceremonies. Actually I’m not into the business of “justifying” competitive-award decisions at all, but in this instance I was tempted to ask a counter-question: “Do you know who actually won the supporting-actor award that year?” I’m fairly sure he didn’t. Back to the film. The emcee turns around, raises his eyebrows, beams in the exaggerated, ingratiating style one associates with a certain type of music-hall performance – it’s his show-business face. And then he starts to sing, in three languages at once. To return to the Oscar question, Joel Grey won the 1972 supporting actor award for this role, over that other “MC”, Pacino’s Michael Corleone. Pitting two very different types of great performances against each other and proclaiming one of them the “winner” makes no sense to me, but I’ll say this much: Grey’s Master of Ceremonies is the most fascinating character in Cabaret. He isn’t on screen for much time – the story proper is about a spirited American singer named Sally Bowles who works at the dance-hall, and her romance with a reticent British writer – but he anchors the film. He’s a I>sutradhar, and possibly a symbol as well. A symbol of what, though? 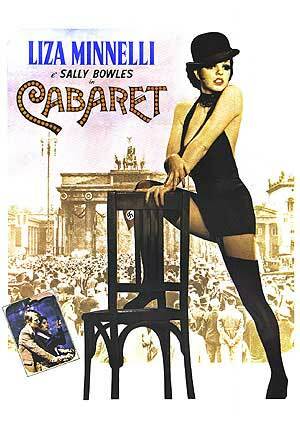 Cabaret isn’t an overtly political movie, but it’s set against the backdrop of the rise of the National Socialist Party. So could the MC be a Hitler stand-in, a despot who controls the decadent theatre of 1930s Germany? But how would that account for his telling his audience, “Leef your troubles outside! In here, life is beeyootiful”, as if to suggest that the music-hall is a refuge from nightmares raging in the real world? Then again, there’s the ambiguity of the song “If you could see her through my eyes”, which he performs with a girl wearing a gorilla costume. It moves between tenderness (the lyrics seem to be a plea for inclusiveness, for accepting people who are different) and possible sarcasm (the show-clinching words “...she wouldn’t look Jewish at all!” have a chilling effect, and the sight gag of the MC putting a wedding band on the gorilla’s nose evokes control and enslavement). What is the person behind the grease-paint really like? We never know, because we only ever see him when he is on the stage, performing. He isn’t part of the film’s narrative, we don’t witness his personal development over the course of the story. (In this sense, could he be any more different from Michael Corleone, whose terrible, tragic degeneration we see over the course of three films and three decades?) Perhaps he lies comatose behind the curtains during non-working hours like a ventriloquist’s dummy, coming to gleeful life at the start of each new show? Perhaps he’s all surface, with nothing underneath – but if so, what a magnificent surface! 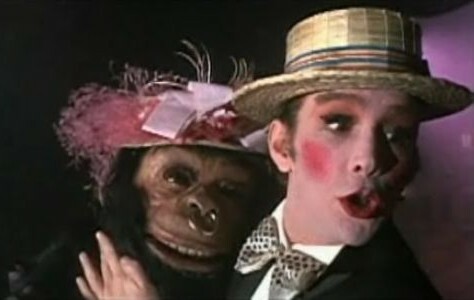 Mesmerising as Grey is, there’s another reason I find Cabaret’s opening sequence so powerful: it shows how a familiar, oft-performed scene from a popular play can be transformed through the use of cinematic techniques. For starters, the use of sound. I’ve heard CDs of two theatrical versions of the musical, and in each case “Willkommen, Bienvenue, Welcome” sounds lusher, more orchestral than in the film. In the film it’s tinny and menacing – the overall effect is more intimate, and that fits perfectly with the way the scene is composed. After all, we are right up there with the MC, just a few inches from his face. A theatre audience is at a more-or-less fixed distance from the action: the whole canvas would be spread out in front of our eyes at once, we would be free to look where we please. But the movie camera can create a very particular mood, starting with that extreme close-up of the distorting mirror, all the more unsettling because we initially don’t know what we’re looking at. The camera can draw back as the MC turns around to greet us, then draw further back to show him in full costume. It can cut to the nightclub audience and cut back to show us the MC again, now in long-shot, twirling his cane as he introduces the dancing girls. When he pointedly looks down into the cleavage of one of the girls (while singing the line “Happy to SEE you!”), we get a close-up of his faux-scandalised expression. At that moment, we aren’t allowed to see anything else. Then there’s the cross-cutting. In the film, as the song’s lyrics welcome the audience to the show, we see glimpses of Brian Roberts, the story’s leading man, disembarking at the Berlin train station. The cuts make a direct visual connection between “arrival” in the cabaret and “arrival” in the country, neatly setting up the allegorical side of the story (also note the symmetry between the shot of Brian looking out of the train window and the one of the emcee peering at his audience a couple of seconds later); the stage version would have had to find another way to make this connection. I’m not trying to chauvinistically exalt the merits of cinema over those of theatre: a skillfully produced play has its own strengths, as well as an immediacy that no movie can compete with. (It’s another matter that some lavish stage productions can be just as extravagant as big-budget movies – at London’s Palladium theatre I saw a performance of Chitty Chitty Bang Bang where the prop car containing the main characters raced out of the stage area and, borne aloft by wires, whizzed about in mid-air right above our gaping heads!) 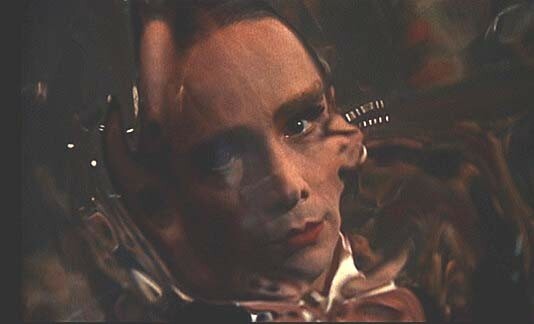 But Cabaret’s opening sequence shows how a well-made film can use precise and interrelated imagery to sharpen a viewer’s focus, to aid our understanding of a character’s function both within and beyond the narrative. Incidentally, that distorting mirror – a brilliant innovation – is used just as effectively in the film’s last shot, which gives us a hazy, now-you-see-them-now-you-don’t view of Swastikas on the uniforms of Nazi officers. By the story’s end they have infiltrated the nightclub, they are sitting quietly with the rest of the audience watching the show. It’s no longer possible to “leef your troubles outside”. P.S. Here’s an old post with a reference to another venerated stage musical, Fiddler on the Roof, transformed through the use of cinematic techniques: such as the scene where the peasant Tevye feels the growing distance between him and his daughters as they make their own choices of husband. I have forgotten details of the film except the impression it made, specially the touch of the macabre due to the background of the grim events going on off-screen. The multilingual opening song-sequence was certainly hypnotic. S M Rana: yes, I can watch the opening 5 minutes again and again - there's a lot more I would have liked to say about the sequence (e.g. the sinister little jig performed by the cabaret girls just after the MC says "Tonight we may lose the battle"), but I didn't want to make the piece longer and more verbose than it already is. Will probably put up a slightly extended version on this blog tomorrow. Agree. But there is a flip side to reaction shots and montage. They can be moronic if they are overdone to the extent of condescending to the audience. I see this in a lot of Indian soap operas on Television, where they show a person speaking and then we've a series of cuts showing the reaction of each person in the drawing room. Back in the 30s, a Hawks or a Lubitsch would've simply shown everybody in the drawing room within the frame. Now, the invisible style may be regarded as "stagey". But it is effective and suffices for most teledramas. Fewer cuts also implies a faster pace of narrative which characterizes most 30s/40s films. Shrikanth: I know you love bringing the old Hollywood masters into every discussion - no problem there - but using contemporary Indian television soaps to score an easy point about bad use of montage? Really? P.S. You've seen this post, right? Jai: Well, maybe it wasn't a fair comparison. But there is a tendency among film buffs to regard films with a very low ASL (Average shot length) as more "cinematic"! For instance, fans of Sergio Leone often gush at his use of closeups. Especially in The Good, Bad and the Ugly where you've entire cuts focusing on a person's eyes. It's fun to watch the first time around, but it does seem very ostentatious and attention-grabbing on repeat viewings. Ofcourse, this scene you've singled out from Caberet appears to be an instance where the use of the reaction shot is particularly appropriate. But more often than not, directors use them when they can do without them. Wonderful piece. Your blog is my first and still my favorite one to follow.